Support of OPGW Fiber Optic Cable – Finn Design Group, Inc. This project involved the addition of a new fiber optic cable to over 20 miles of existing steel transmission line towers. At some locations, the new cable replaced a static ground wire cable. 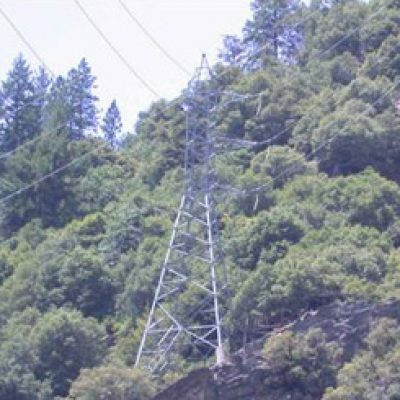 At other locations, the new cable required provision of a new means of attachment to the existing towers. Our scope included the calculation of loads to the towers due to the dead load of the cable and wind load acting on the cable. Every span was considered (including span length, relative ground elevations, tower heights, and cable properties) in order to determine the worst case cable loads. The existing peak assemblies were then checked for their structural adequacy. At the towers without a peak, a new assembly was designed and detailed out of structural angles and plates. The project also included the evaluation of two different types of towers for their structural adequacy for supporting the new cable loads. A 3D finite element analysis was performed for both a 55 foot and 65 foot tall tower with all applicable conductor and cable loads.